The industry-first enclosed claw vacuum system decreases noise levels, allowing the vacuum system to be installed right at the point of use. Perfect when paired with our enclosed air systems, offering the lowest noise levels on the market. Powerex’s trademarked sound enclosure systems offer the lowest noise levels in the industry. Each system is packaged in a rigid steel frame with powder coated panels and lined with sound-deadening insulation. Claw vacuum pumps are enclosed within sound-reducing panels – an industry first! 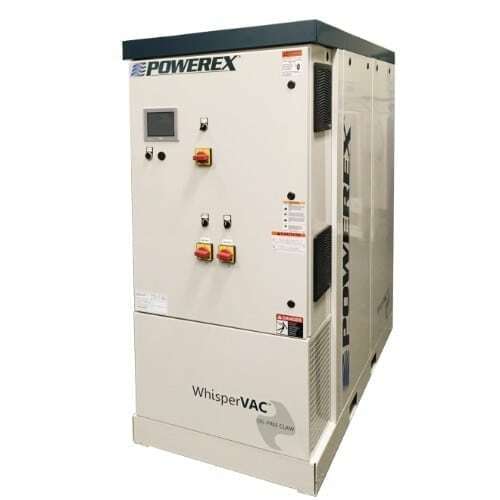 Ultimate sound reduction achieved when packaged with Powerex WhisperAir™ enclosed scroll medical air systems – the quietest source equipment in the industry! Patent-pending internal pump cooling system ensures vacuum pumps operate well within acceptable temperature ranges.